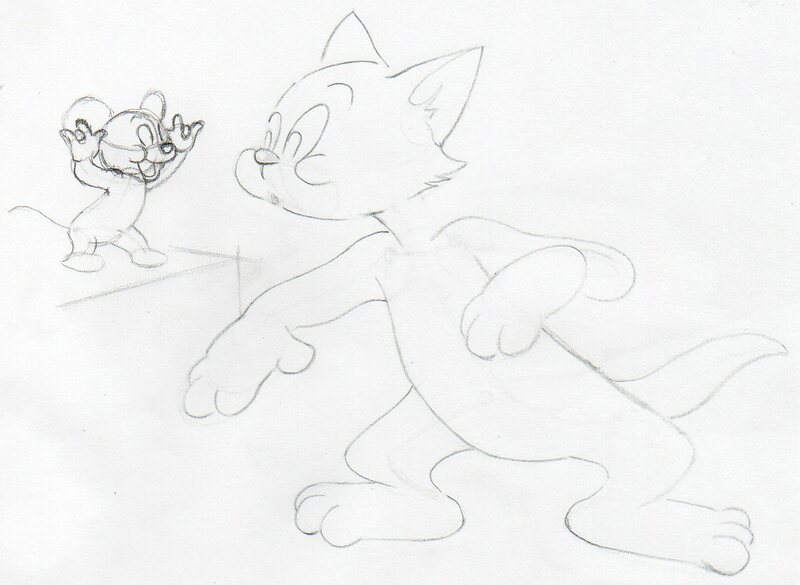 Wanna know how to draw Tom and Jerry? Here you go. Scroll down this page and there you have the tutorial. These two inseparable cartoon characters brought so much joy and good time for so many kids and adults. Did you know that Tom and Jerry were created in 1940! Nearly 70 years of constantly growing popularity! There must be something in those characters created back in cartoon - big time era. I bet no one would dare to predict at the time that either Disney Characters or classical cartoons like Tom and Jerry or Popeye would become so loved by generation after generation for the whole century. 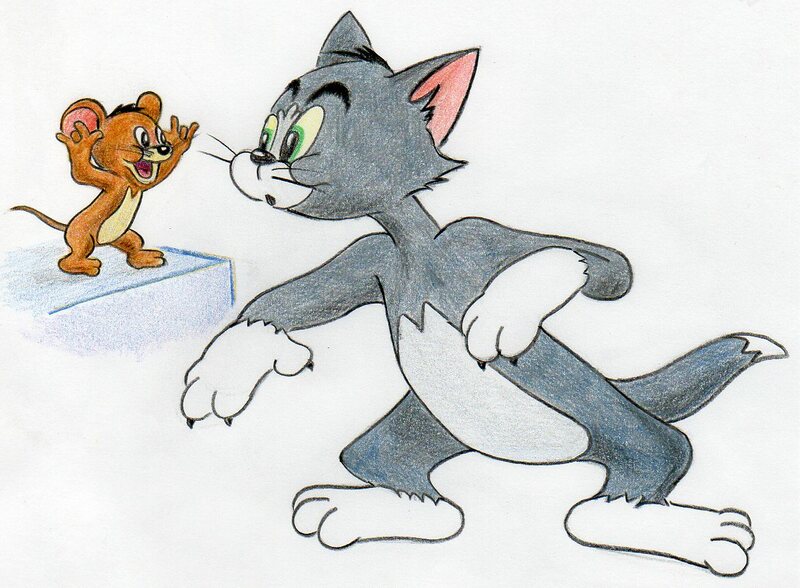 Comparing to other cartoon characters, Tom and Jerry is a pair. 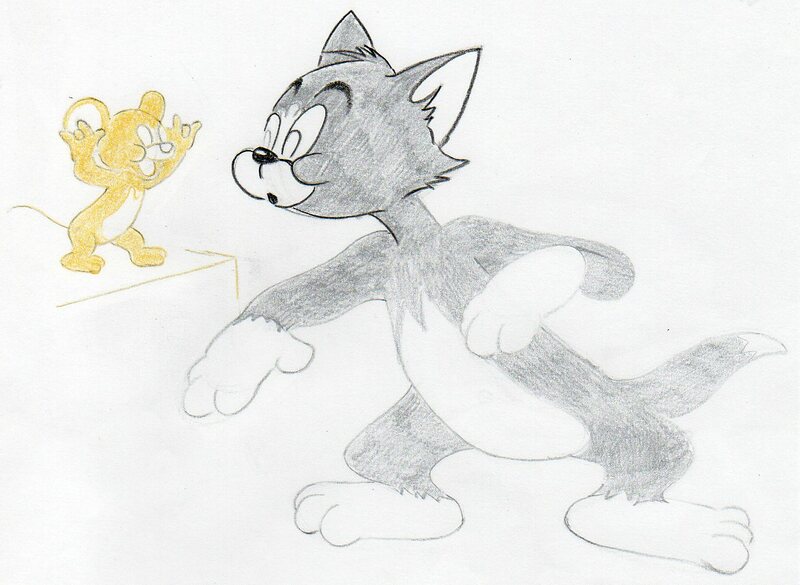 You can of course draw either Tom or Jerry, but it wouldn't be a complete picture. 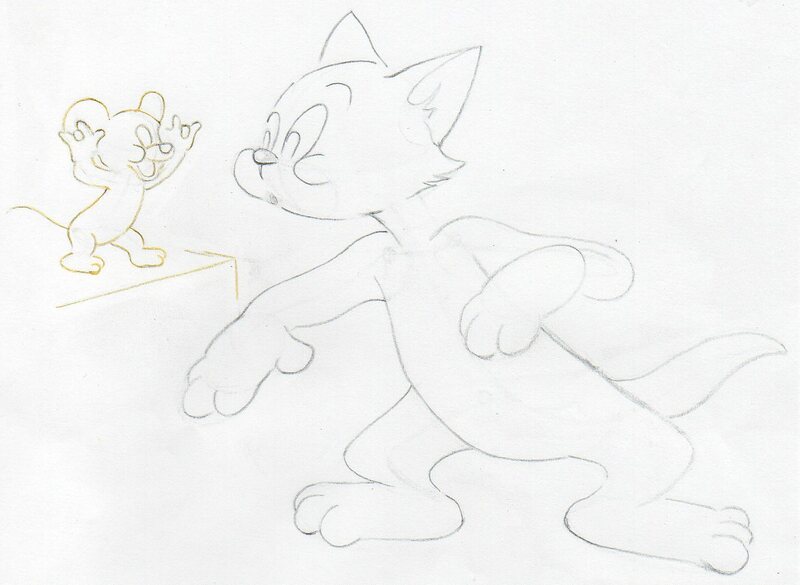 To draw Tom and Jerry may look at first a bit complicated but I show you the step by step process how to draw piece by piece, layer by layer, so relax, prepare your pencil and paper and let's do it. 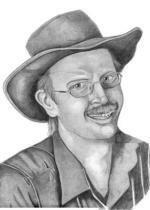 We begin drawing Tom first. 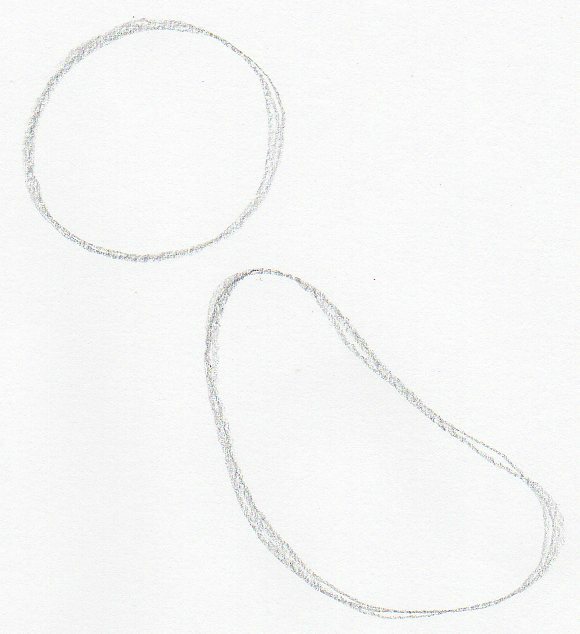 Sketch a circle, that will be Tom's head and a peanut-like noodle shape, which will be Tom's body. Here comes the important part. 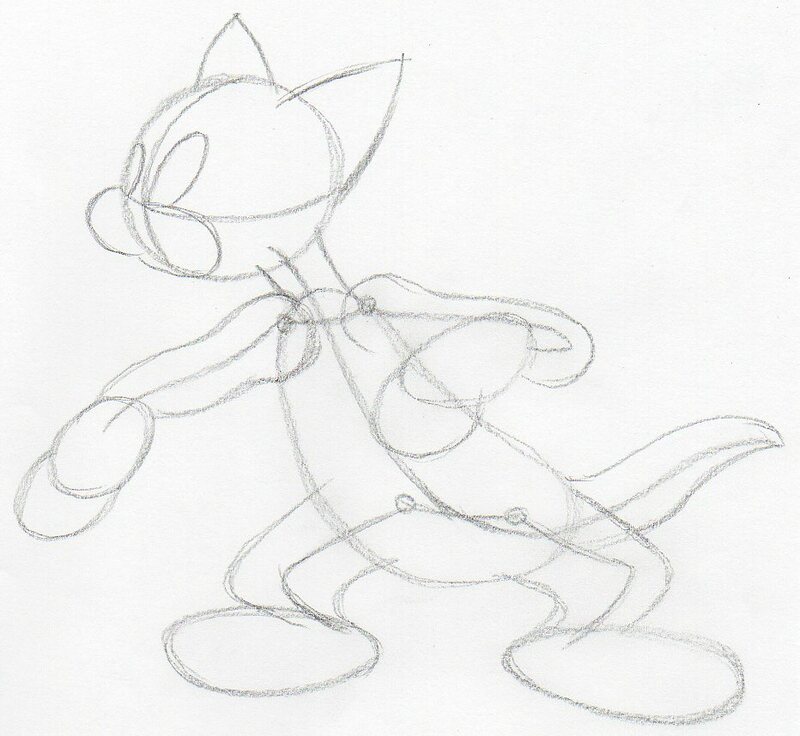 Sketch a simple skeleton-like structure into the Tom's body as you see on this picture. Begins from the neck, goes along the body like a backbone and continues to the tail. 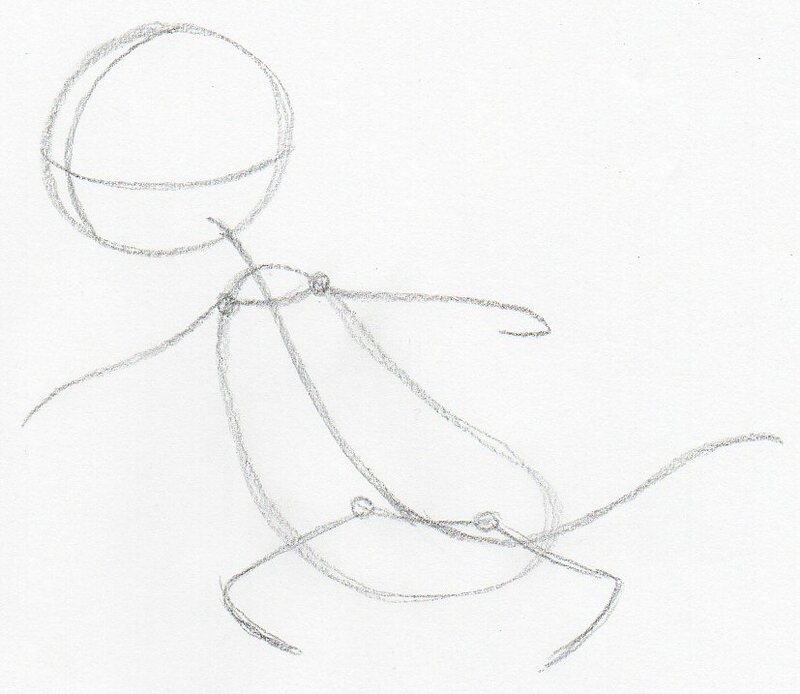 Hand and legs are attached on small circles-joints. Sketch a center line across the head in both directions, horizontally and vertically in similar fashion as you see here. Sketch the paws (hands) and both feet as you see here. Make sure that the size and proportional balance is correct. 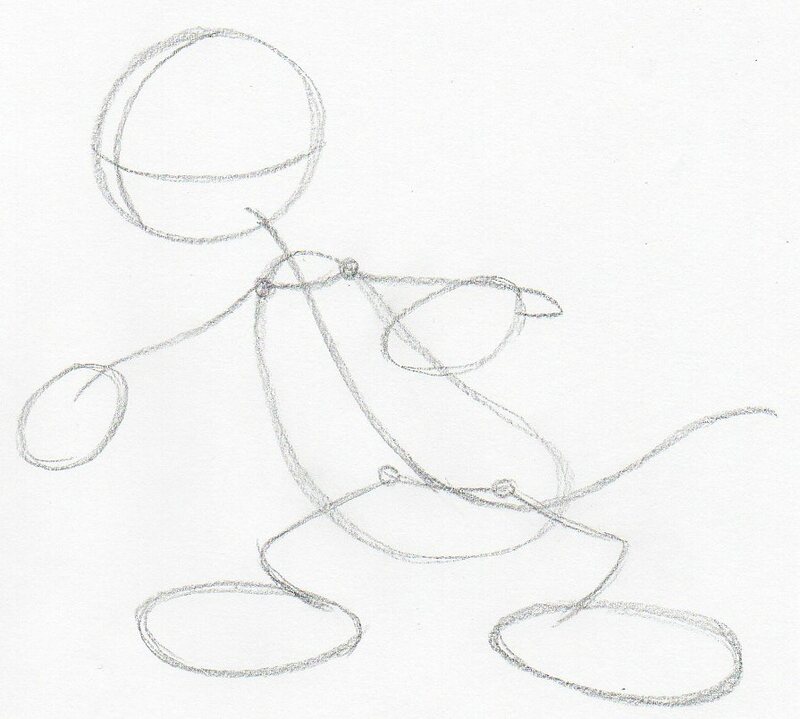 This method of drawing is bit different from other cartoon or Disney Character drawings. It is quite simple so can easily continue with the tutorial. 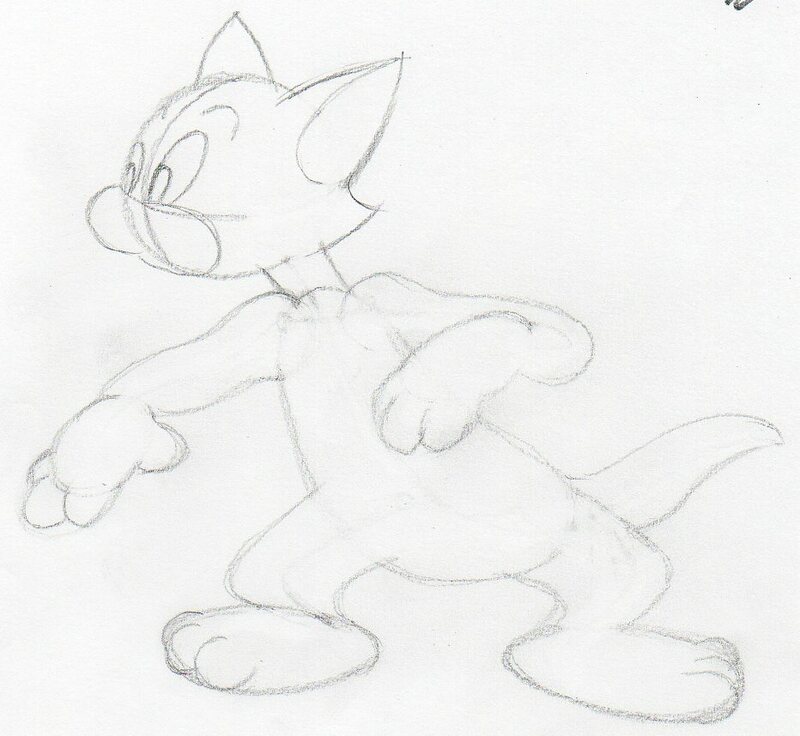 Flesh out the Tom's body by sketching the arms and legs contours. Also add the first face features and the ears. Begin erasing the unnecessary pencil guide lines so that you get a clearer total body silhouette and add some details to the eyes. Shape the nose and mouth. Notice how Tom has a surprised-like face expression. A pen-shaped eraser will now come very handy. Erase all unnecessary pencil dust to get a clear body contours . 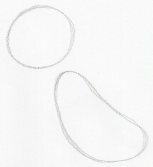 Draw a clean distinct contour line around the whole body. Sketch out the Jerry's body. The process is exactly the same as you did when sketching Tom. 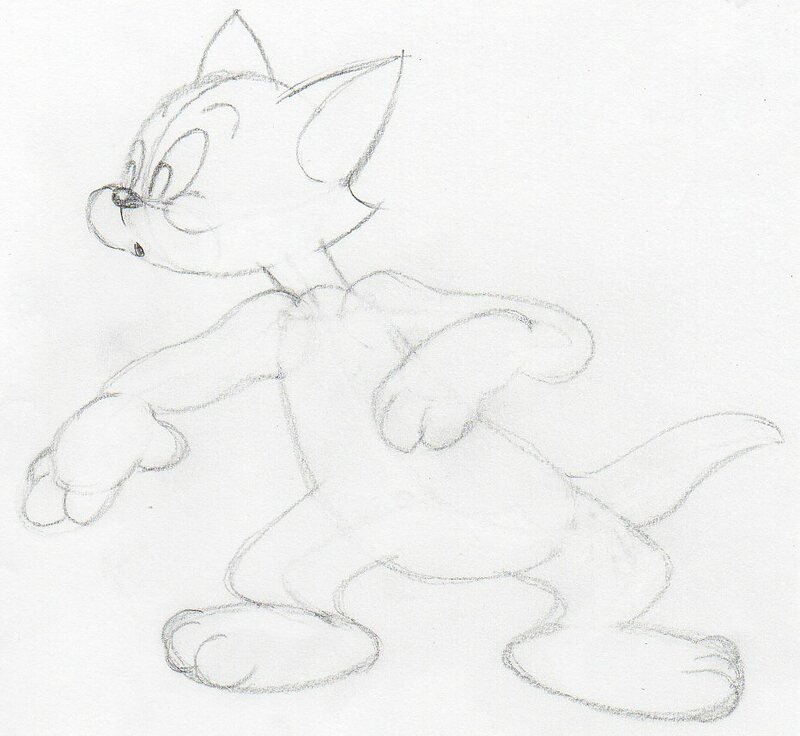 I did not go through showing the same drawing sequence as for Tom, in order to simplify the steps. I suppose you've learned them already. Jerry's body is small therefore you do not need to pay attention to very tiny details. Basically, the rough sketch is now ready. You can say you've learned how to draw Toma and Jerry, because from now on comes the easy part. 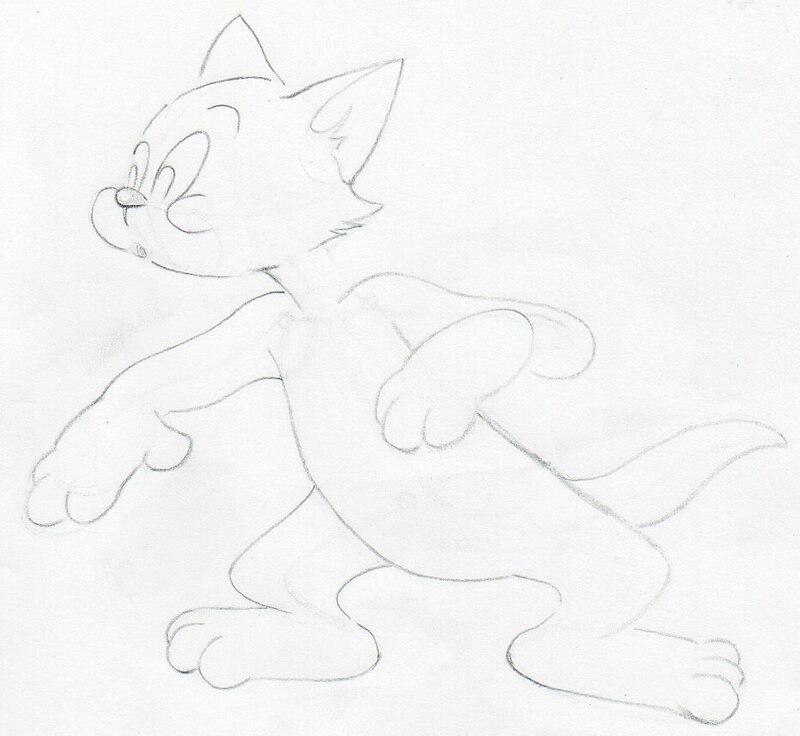 Refine Jerry's body, erase the pencil guide lines so that you'll have a clean Tom and Jerry coloring page. Begin coloring both characters. First use only flat color, no shading, no darker or lighter tones yet. 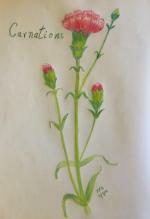 The first layer of color will serve as a perfect base for coming color layers. Add more darker color tone over the previous layer in order to achieve a fuller color. 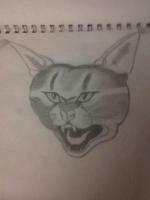 Start shading both Tom and Jerry in similar fashion as you see here. 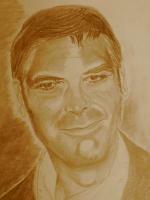 As a final touch, use a black color well sharpened pencil and outline both characters entire body contours. 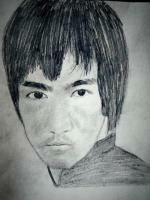 Pay special attention around eyes area and other face features. 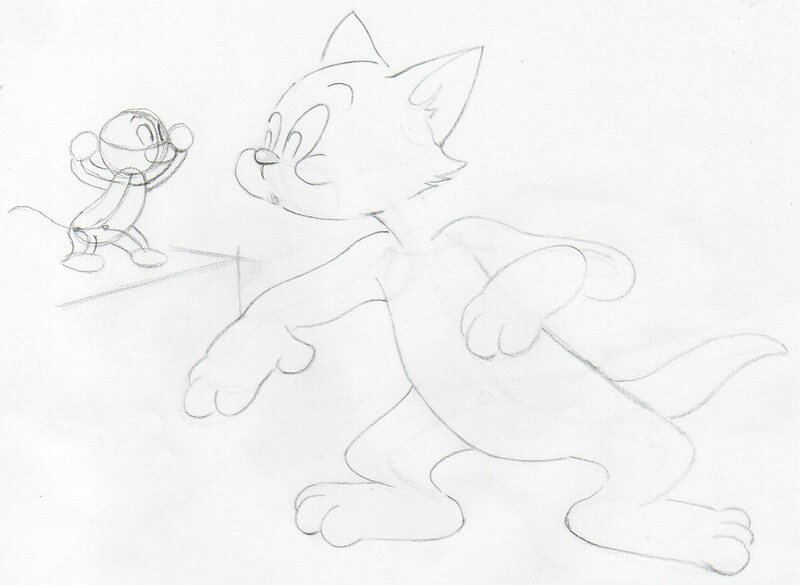 You have now learned how to draw Tom and Jerry. Drawing two characters is not always easy because you have to pay special attention to the overall size and proportion balance of both characters simultaneously. 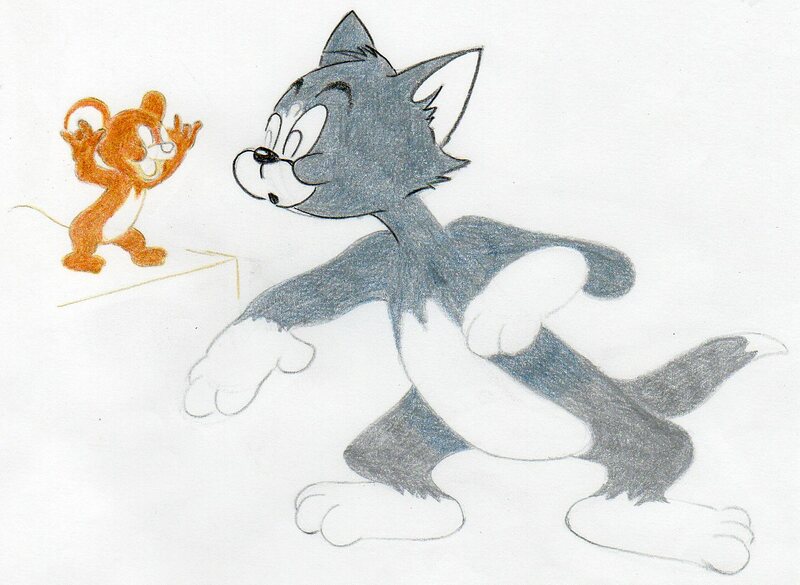 We all would like to see your drawing of Tom and Jerry. 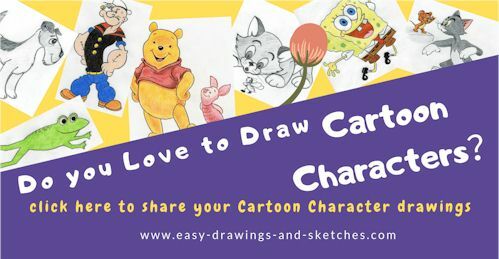 Click the banner below to upload your drawing.